If you work in an industry that requires dimensional inspection, you know how important it is to get accurate, precise measurements in a timely manner. Poor testing procedures and equipment can cost you a lot of time and money, both in the short-term and in the long-term. In order to meet minimum quality standards you need the right equipment and a trained staff that knows how to use it. Because such a high degree of specialization is required, many businesses opt to outsource dimensional inspection services to a provider that has the necessary expertise. In addition to being cost-effective, another benefit of outsourcing these services is the ability to obtain independent third-party validation. Equipment quality - State-of-the-art measuring instruments are required to get the most precise measurements. Ensure that any provider you work with uses only the best available equipment. Facility quality - A good provider will have an environmentally controlled facility with high security standards. Customer confidentiality should be a priority and the provider's facilities and policies should be reflective of this commitment. Testing diversity - There are countless measurement and inspection needs across a broad range of industries. A provider that works across multiple industries and provides a diverse range of testing methods will be able to meet your dimensional inspection needs, no matter how your business changes over time. Trained staff - The most sophisticated equipment is useless without highly trained metrologists, test engineers, and technicians to operate it and analyze results. Regulatory standards - Look for a provider that is ISO 17025 accredited to the minimum standards required in your industry. All measurements should also meet NIST (National Institute of Standards and Technology) traceability standards. 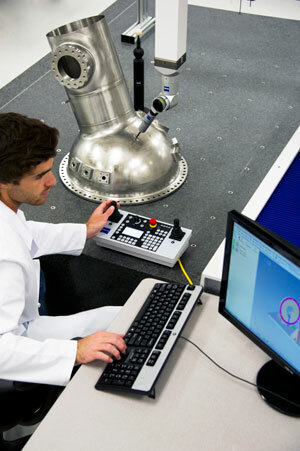 Reporting capability - Analysis of test results is a critical part of the dimensional inspection process. A good provider should be able to customize reports so that you and all other stakeholders can clearly and quickly understand the test results. Portability - In some cases, you may need the equipment and the testing personnel to come to your facility. Q-Plus Labs meets all these criteria and more. We are a full-service provider with expertise in a variety of industries, manufacturing methods, and testing technologies. Whether you need to validate a valve for a race car, the curvature of a prosthetic, or a surface profilometry measurement for a machined part, our highly trained staff has the expertise and the technology to do it. Contact us today to learn more about the benefits of outsourcing your dimensional inspection needs.